Benjamin W. Charrow ’08 wears a “CRYO-FAC” box in reference to East Campus’ Friday Afternoon Club at the 2008 Campus Preview Weekend in Johnson Ice Rink yesterday. A record number of prospective freshmen — 1021 — have descended upon MIT for this year’s Campus Preview Weekend, according to Ben Jones, Associate Director of Admissions. The event, which ten years ago was meant to attract women and minority students to MIT, is now open to all admitted freshmen. CPW has grown explosively since then, increasing from 974 last year and 868 the year before. 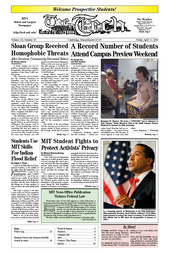 A Sloan student was not expelled or suspended after sending a homophobic, threatening e-mail to members of the Sloan LGBT student group. A New York City Law Department subpoena to an MIT graduate student over text messages has raised questions about how the First Amendment protects online speech, and whether the government is allowed to ask service providers for messages they store. I arrived in Delhi, like most international travellers, in the middle of the night, when the temperature was a mere 70 degrees. I walked out of the terminal to see a melee of taxi drivers soliciting the custom of shell-shocked travellers with the latest Bollywood hits blaring out of tinny speakers. It was, you know, the usual spring break scene.